While Esme got our childen, Alice and Adam, ready I packed my backpack. I was hoping to capture some scorpions so I made sure I had plastic cups and plastic bags for collecting and carrying with me. I also double checked my digital camera, GPS tracker, and voice recorder. I still have to get into the habit to use the latter more often so I can write with greater ease about our adventures off the beaten track. A view down into the green canyon near Alto de Tio Diego. The four of us walked to a small shop near to our house to get some bars, water, and some fruit. Since I hadn't had breakfast yet, I got up later than planned, Esme bought two tortas for me. When done shopping we flagged a taxi and asked the driver if he could drop us somewhere along the road between Alto de Tio Diego and Alto Lucero. He agreed and asked Esme how much we normally paid for this trip. I said 150 pesos to which he agreed. We've made trips like this before and I have by now quite a good feeling for taxi rates. Another view down into the canyon, more down slope. After quite a drive with fantastic views the higher we got we passed the town of Alto de Tio Diego on our right. The taxi kept following the road to Alto Lucero per our request and soon we crossed the canyon. 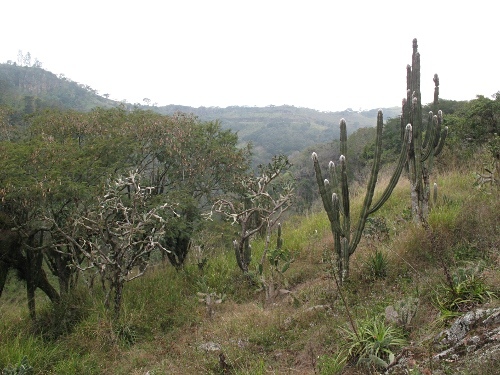 A few minutes later we could see the town of Alto de Tio Diego to our right again and I knew we were almost there. But a lot had changed in a year; it was nearly a year ago when I took Oscar F. Francke, Gerardo Contreras, and Carlos E Santibañez Lopez to this place to collect specimen of what might me a new Megacormus species, a small scorpion species I stumbled upon over a year ago. So I was somewhat unsure and asked Esme if she could ask the driver to stop. It took him a while to react most likely because of the unusual place for a halt but then he parked the car to the side of the road and we got out. Cactuses on a canyon slope. I was somewhat sure that we had to walk back, but after I got some of my gear out I started to doubt which direction to go. So at first we kept walking down the road in the same direction we had been driving. But when the road started to curve to the right I was very certain we had overshot the spot I wanted to start our hike and so we walked back. After a minute or two I was sure of my earlier decision, this was the right way to go. And soon enough we ended upon the gate, which was already open, and started to walk down the grassy slope to reach the river at the bottom of the canyon; the location I wanted to explore. At first the grass was very high, at least one meter. And at times it was hard to see where the track was, exactly. I carried Adam on my neck, while Esme helped Alice. At times the track could be slippery and stones that could roll away when stepped on them didn't help either. After some time we ended upon a part with less grass and more stones and cactuses and other succulents growing. 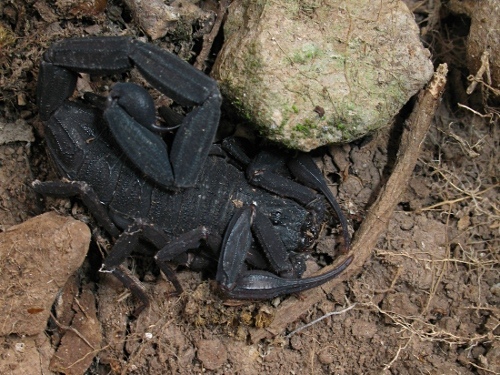 I checked underneath stones for scorpions, especially since this looked to me like a suitable habitat for Centruroides gracilis; a common scorpion in the state of Veracruz which can be found in very varied habitats, including grasslands. And since we had found this species on the other side of the canyon we were descending, closer to the town of Alto de Tio Diego it was no surprise when I found the first trace of this species; a cast-off exoskeleton (exuvia) underneath a small stone. 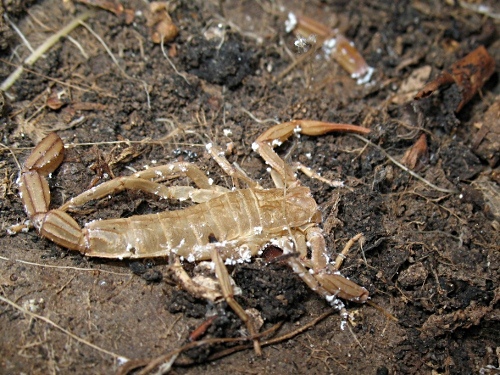 The cast-off exoskeleton of a Centruroides gracilis juvenile. We continued our walk further down after I had checked underneath nearby stones for scorpions and found none. Soon we came upon a large flat moss covered rock. The first time we visited this part of the canyon my mother had accompanied us. Back then we had walked from the town to the river and up the slope we were now following down. At at this spot we had held a short break to catch our breath and eat and drink. The track curved around the rock while going down further. After the curve the rock had several cracks resulting in several pieces of stone which looked easy to remove. So I removed a small piece and found my first living scorpion of that day: a juvenile Centruroides gracilis. A juvenile Centruroides gracilis trying to hide. After being uncovered the little scorpion started to look for a place to hide. I took a few photos of the juvenile and then removed a larger piece of rock and uncover an adult male and female of the same species. The adults were way more skittisch and first the male and then the female disappeared into a large crack. I could remove another piece of stone and found the male. Sadly I couldn't make a good picture before it ran away again, deeper and harder to reach. I managed to uncover the female again, and could take a close up photo of her. 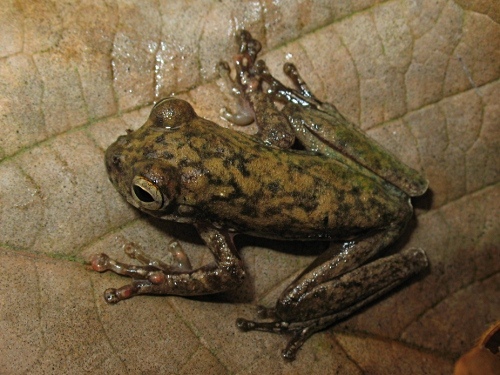 Adult female Centruroides gracilis, close-up. 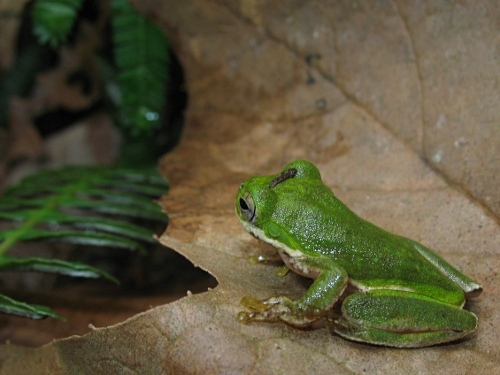 Notice in the above photo the very dark color of this specimen and how parts of the tail look somewhat blueish green. The latter effect is most likely fluorescence of the exoskeleton caused by the ultraviolet light in the sun light shining on the scorpion. The dark color and the looks of this scorpion make it appear to me like velvet, but not the kind of velvet one can touch safely since the sting of Centruroides is reputed to be very painful. I carefully replaced the pieces of stone I had removed and discovered the slough shed by a snake while doing so, probably left by a gartner snake since the habitat is close to water. We walked further down the slope of the canyon and soon we could hear the river and frogs croaking. A welcoming sound since I guessed that they were tree frogs and I like to take close up photos of those. Soon we came upon the river and crossed to the other side and walked a bit downstream, closer to the area I wanted to explore. Alice had to answer a call of nature so Esme helped her while I carried Adam to a large rock close to the water and sat him on top of it. Since Adam loves to throw pebbles and small stones into the water I collected a few for him. And soon he was laughing and launching his small projectiles in the general direction of the river. As you can see in the above photo the area close to the river is very green. 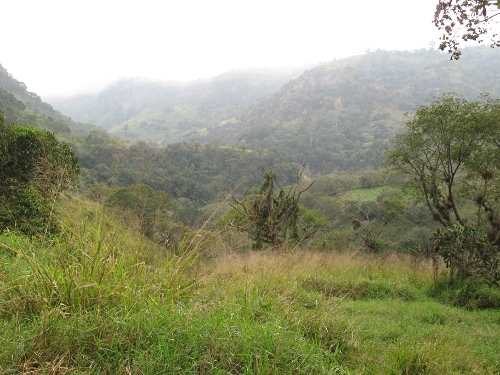 A bit higher, away from the river, coffee is grown in the shadow of larger trees; the area I had planned to explore. 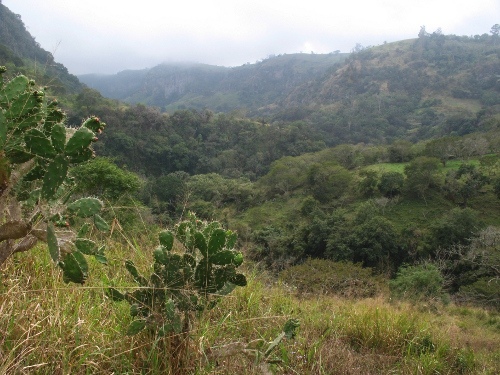 The first time we visited this part of the canyon I had found two small scorpions, both belonging to the genus Megacormus in pieces of rotting wood I had found between coffee plants. 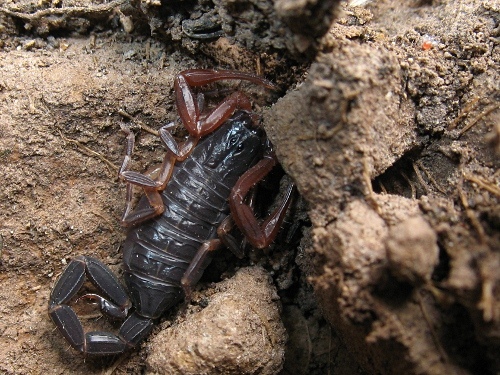 During a second visit, accompanied by Oscar, Gerardo, and Carlos, I collected two Megacormus specimen and two subadult specimen of the species Diplocentrus melici, a beautiful dark colored scorpion that I had encountered in two other barrancas over the years. Back then, in total 10 Megacormus specimen were collected. So for today I hoped to at least to be able to collect 2 "diplos" and 4 "megas". 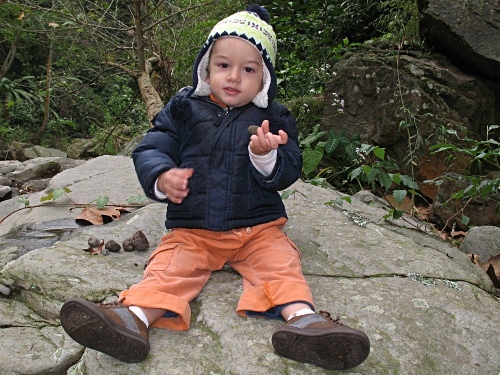 While I was taking photos of Adam sitting on the large boulder Esme called me; she had found the first frog of the day. So I went down to ground level with my Canon A640 and made several close-up photos of the tiny bright green amphibian, trying not to disturb it too much, since nothing harder than making a frog stopping to hop arround in order to be able take a photo or two. The frog was very cooperative and I could take several nice photos. While I was getting ready to start looking for scorpions Esme spotted another small tree frog. This one was light brow with a dark green pattern. It was close to the river and after a few hops it was in the water and swam underneath death leaves resting on the bottom close to a boulder. I could get onto the boulder easily. I moved carefully the leaves until Esme saw the frog swim away again, and hiding underneath another leaf, close to the riverbank. I got my camera out and carefully moved the leaf away without disturbing the frog and could take tree pictures of it through the very clear water. 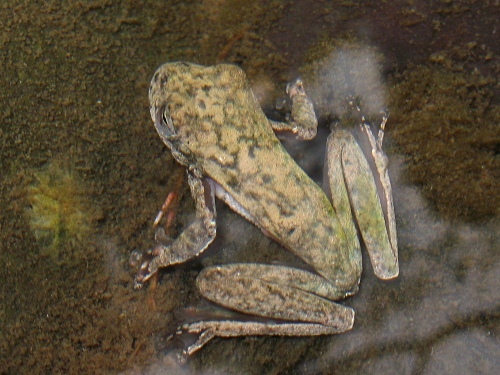 A tree frog in the river. After the short photo session I got a small plastic container with lid out of a small carrying bag and carefully captured the small amphibian since I wanted to take some more photos of it on the riverbank. I managed to get the frog into the container on the first try and soon enough it was "posing" on a dead leaf on terra firma. Notice that the colors of this specimen are very different from the bright green one, very light brown with a moss green pattern which makes it hard to spot on dead leaves. 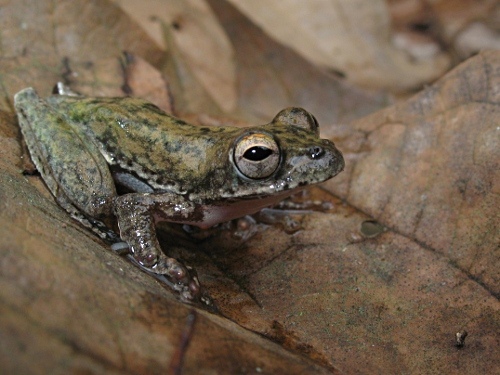 Yet, I am quite sure that its the same species since frogs can be highly variable in appearance. After I had taken a few photos from the side I also took a few photos from above. In the photo below you can see how well this variant of this tree frog species blends in its surroundings of dead leaves. 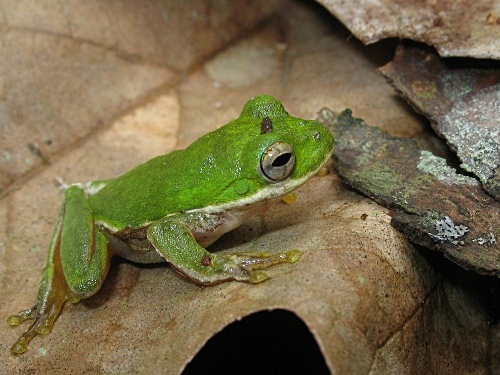 Top view of the small tree frog resting on a dead leaf. While those two tree frogs were a very nice encounter it was now really time to start looking for scorpions. Adam and Alice were playing near the river under the watchful eye of Esme while I left to explore the riverbank downstream. Read the second part pf this blog entry in Exploring the riverbanks.